After entering the weekend with optimism, Paul Menard and the No. 21 Menards/Cardell team experienced disappointment from the start to the finish of Sunday’s Can-Am 500 at ISM Raceway near Phoenix, ending the race with a 29th-place finish. 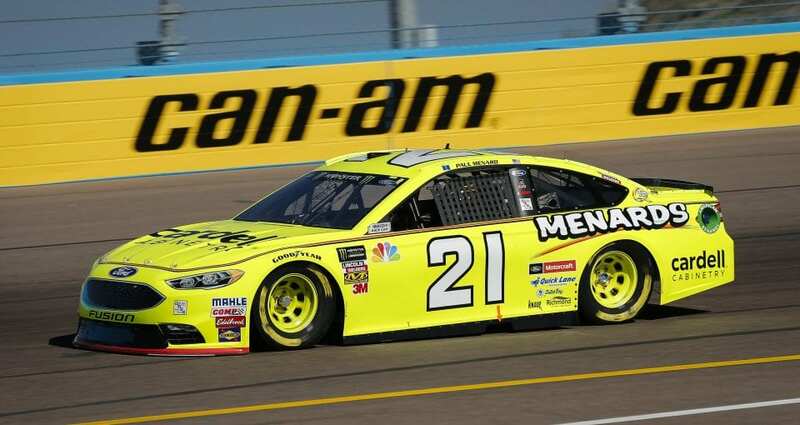 Menard qualified a strong 11th on Friday at Phoenix, but near the end of practice on Saturday he experienced a tire failure, which led to contact with the wall. That forced him to an untried back-up car – and to the rear of the field – for the start of Sunday’s 500-kilometer race. Menard initially moved forward but before four laps had been completed, the engine in his Menards/Cardell Fusion lost a cylinder. Menard soldiered on despite the loss of power, and his crew spent several pit stops trying to solve the problem, changing coils, wires and spark plugs. On the team’s final pit stop, the crew eventually found the faulty wire and got the engine going strong again, but by that time Menard was nine laps down to the leaders and had no real chance to improve. If there was a bright spot to Sunday, it was the fact that the two of the drivers he’s battling in the points standings, Ricky Stenhouse Jr. and Daniel Suarez, also had troubles, so the battle for positions 18-20 in the season standings will continue through next weekend’s season-ending Ford 400 at Homestead-Miami Speedway. Menard, who entered Sunday’s race in 19th place, four points behind Stenhouse, was able to move into a tie with Stenhouse at 680 points, while Suarez remains 20th, 13 points back.